Due to its location, Vietnamese maritime area is heavily affected by tropical climate. It often severely suffers from natural calamities and maritime environmental incidents. People are ever intensifying their activities on sea due to its numerous resources that can bring about benefits for them. In addition, global climate change causes more complex situation. In 2015 alone, Vietnam suffered from nearly 900 accidents on sea, causing the dead and missing of 352 people and damaging 517 boats (11.14% higher than 2014). As a result, enhancing the capacity to search and rescue on sea is an urgent requirement. Over the past years, the Party and State have always paid attention to developing forces for maritime search and rescue (including specialized, semi-specialized and mass forces). They are: the Navy, the Coast Guard; Fishery Control force; Border Guard force, Air Force, Maritime Transportation force, etc. The foundation of Vietnam National Committee for Search and Rescue; oil spill response centers (in northern, central and southern regions), and search and rescue departments of the Military, Maritime and coastal provinces, etc were also for this purpose. 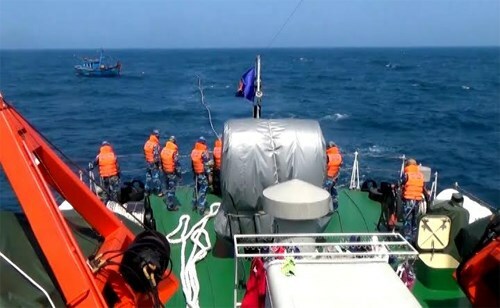 In particular, forces of the Maritime Agency involving in the work include: Vietnam Maritime Search and Rescue Coordination Center; Maritime Administrations; Vietnam Coast Radio Station System; unified system for ship surveillance, etc. Thereby, the maritime search and rescue are gradually organized, directed and operated in strict, scientific, effective manner that have gained important initial achievements. In the first 9 months of 2016, though natural calamities on sea happened continuously, with their uttmost efforts, forces have successfully conducted search and rescue 471/640 cases which is equal to 73.59%; saving the lives of 2,842/3,187 people which is equal to 89.71%, contributing greatly to minimizing losses of people and property. Besides the achievements gained, the awareness of incidents on sea of some cadres, people, organs and units, with vehicles operating on sea, are still limited, hence there remains limitation in the search and rescue work. They are not active in prevention and seem to rely on the government support. Besides, there remain shortcomings in the coordination mechanism in task performance, the capability and level of human resource as well as of the vehicle and equipment, leading to the ineffectiveness of the work. To continue to enhance the effectiveness of the work, in the new situation, the Party and State will uphold the synergy from all levels, sectors, forces and the entire people; combining internal resource with international cooperation; and launching a number of synchronous measures. Accordingly, the State will soon establish a governmental organ in charge of the work. Then a system of search and rescue offices from central to local level will be founded. Attention continue to be paid to developing forces and procuring modern equipment, particularly, specialized vehicles to set basis for founding search and rescue centers in each region. At present, the Government is socializing the work with a view to mobilize the utmost potential of the whole society and at the same time planning for building, training and nurturing staff working in the field so that they have broad knowledge, comprehensive capability meeting mission requirements in the new situation.